Advent-Christmas 2018- A new gift from an old friend! I got a nice gift the other day. It’s that time of year. 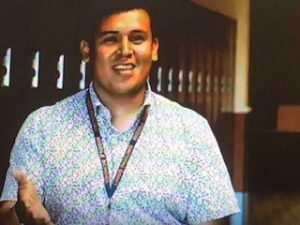 It was in the form of an email sent from the Corvallis School District. Hmm … do I know anyone who teaches in Corvallis? “It’s me, Avi Hernandez!” My mind raced back to 2000 or 2001. Avi was one of my first-grade reading buddies at Highland Elementary. A quiet little guy but so eager to learn. During our recent office move I found a thank-you note Avi gave me. (Yes, I’m a hoarder, um, historian!) I followed Avi as he matriculated from Highland to Parrish. He was a regular at the Boys & Girls Club and graduated from North High (Go Vikings!). I remember him as a volunteer soccer coach at Parrish during his college years at Western Oregon University. The dots began to connect. I clicked the link and—three speakers in—there was Avi! Advocating for the dual-language program at Linus Pauling Middle School in Corvallis. And, sharing his own testimony about mentors, positive places, and second chances. I remembered him sharing that he was tempted by the gangs and not always making good choices. But there was a conspiracy of people who believed in him and spoke blessings into his life. Teachers, coaches, neighbors, youth workers, professors. The gifts of time and love, willingly shared, without knowing for sure how things might turn out. Both science and the scriptures agree: relationships are good. People helping people. Walking alongside each other over time. At SLF, we are often asked “How can I (my family/my business/ my church) make a difference?” We have a very fancy answer that has developed over 22 years of research and practice. “Show up and stick with it.” So simple; so life-changing. Schools. Neighborhood associations. Youth sports. Mentoring and tutoring. Foster care. English classes. Youth ministry. Homeless outreach. Job training. Re-entry from prison. Refugees. So many great options! It only takes one. At this joyous Christmas season, may we encourage you to give—to yourself—the gift of giving. With God, it’s never a one-way transaction. As my friend Mark Bulgin of Isaac’s Room teaches, Person A and Person B both get better! Oops, gotta go. I want to send Avi a thank-you note for his amazing gift. Merry Christmas! STOCKS AND IRA GIFTS CAN HELP US MAKE THE ‘YEM’ BY 12/31. One of our main Development strategies occurs during the Christmas season. We are blessed to have a core group of SLF supporters who have pledged major gifts that we need to match at this time. It’s not a burden, it’s an exciting challenge that we take very seriously, but also with a sense of motivation and fun. So far we’ve raised more than $10,500 toward our goal of $75,000 – still a ways to go. For many folks out there, this might be a good time to make a year-end gift of appreciated stocks. Or a tax-free IRA distribution. It can be a much better deal for both the donor and the charity (consult your financial advisor for details). SLF has a brokerage account with Morgan Stanley Smith Barney that makes for swift-and-efficient acceptance of equity gifts. Please know that all gifts of all kinds are greatly treasured. The next four weeks are critical to our financial fortitude, and we hope/pray you can help us match those dollars. Thank you. WEB: You can also give online at https://www.salemlf.org/donate/ – look for Year-end Match! 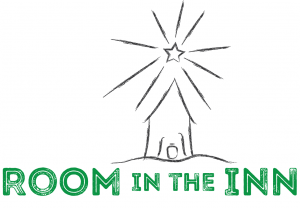 INVITATION TO SERVE: ‘ROOM IN THE INN.’ (From DJ Vincent) It is with joy and excitement that I share this Christmas opportunity with you again this year. For the eighth year we are inviting our friends-without-homes to a 2-night stay and four meals at Aldersgate Camp in Turner. It is our hope to host them as Jesus himself. Last year we saw the radical impact of making space for 192 people at our table and family celebrations. This year we hope to host 180-200 people for two nights, share four meals and celebrate the incarnation of Jesus together. We are so thankful for the partners, volunteers and sponsors that make Room in the Inn possible. For more info, contact Gabi at gabi.vincent@gmail.com. It promises to be another life-changing year of miracles and joy. Not only do many of the guests begin a new journey of health at Room in the Inn, but the volunteers are eternally changed, too. Thanks & Merry Christmas! in February. It avoids conflicts with other non-profit golf events, and it provides a unique opportunity for SLF friends to raise much-needed bucks for our work. The 8th annual RainFest Golf Challenge is confirmed at Salem Golf Club for Monday, February 25. SPONSORS: We’re seeking corporate sponsors ($500, $1,000, $2,000) and golfers, with a ‘tee-off’ event in the works, as well. Our goal is to slot 36-44 golfers who will muster $2,500 or more in pledges ($100,000 goal!) If you think you’re game, please email ‘Slammin’ Sam Snead’ at Sam@salemLF.org to reserve a tee time. Got Parka?